We are one of the few agencies in the country that is both Google Partner and Facebook Blueprint Certified. In the world of marketing where everyone claims to know what is best for you, we've been tested to prove our knowledge and techniques are the best in the industry. Once a month we offer Facebook Workshops designed for small business owners, DIY marketers, solo entrepreneurs or anyone else looking to elevate their social media marketing abilities. We go over some simple methods to execute expert tips and tricks. We also set up tools that you most likely do not already have access to in your account. As local marketing experts, we speak at conferences and events to help businesses big and small better understand the ever-changing marketing landscape. We are honored to have been recognized for our work locally and regionally. Below are some of our recent accolades. We have been identified as one of the top 100 Small Digital Marketing Agencies in the Midwest! Criteria for selection was based on current growth and potential influence on the market. We are one of a few agencies in the country to pass Facebook's expert level Blueprint Certification course. The only course Facebook recognizes as testing a marketer's abilities using all of Facebook's business platforms. 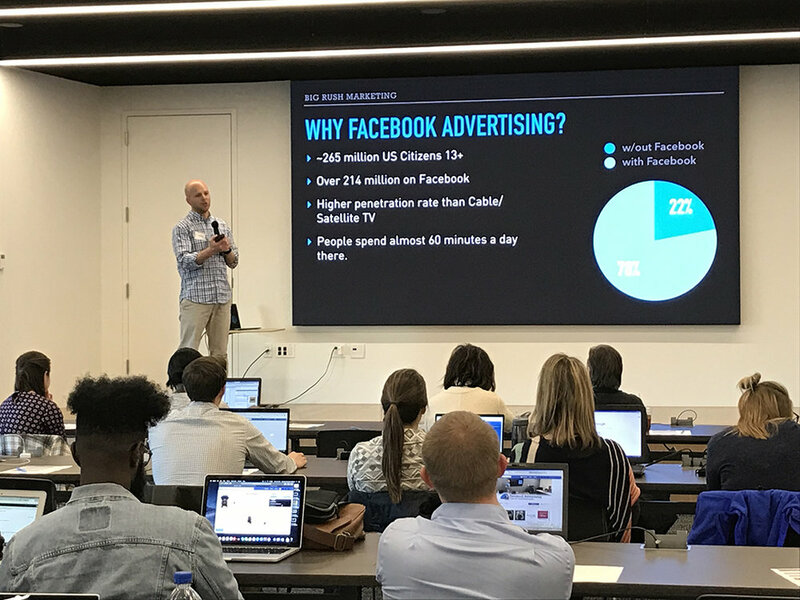 We presented at the 2018 Midwest Digital Marketing Conference and sat on the expert panel for Facebook advertising. The world of digital marketing is an ever-expanding and increasingly confusing place. That's where we come in! Take a look at some of the services that we offer below, or better yet, just get in touch with us so that we can talk about your needs. We'll work with you to put together a unique plan that meets your businesses unique needs. Many marketers and agencies claim to be social media experts be we actually passed the test to prove we know how to market a business on social media at the highest. As a Facebook certified agency, we can help you use one of the most powerful marketing tools to its fullest. We make things look good. Whether you need print graphics, digital graphics and entire website or anything in between. We can make anything you need look professional. If you need a re-brand or are starting a company from scratch, we can give you a look that matches your style with what your customers will love. Digital Advertising offers an unprecedented bang-for-buck in terms of reaching people and tracking success. It also offers what can be a paralyzing amount of options: Google Search, Display, Remarketing, Google Merchant Center, Pandora, Spotify, YouTube... Working with us means you are working with certified professionals in the field of digital advertising. a high performing integrated marketing strategy can require a lot of different and sometimes expensive pieces. For businesses lacking the resources for an in-house team of professionals, we can provide every service needed at a fraction of the cost.